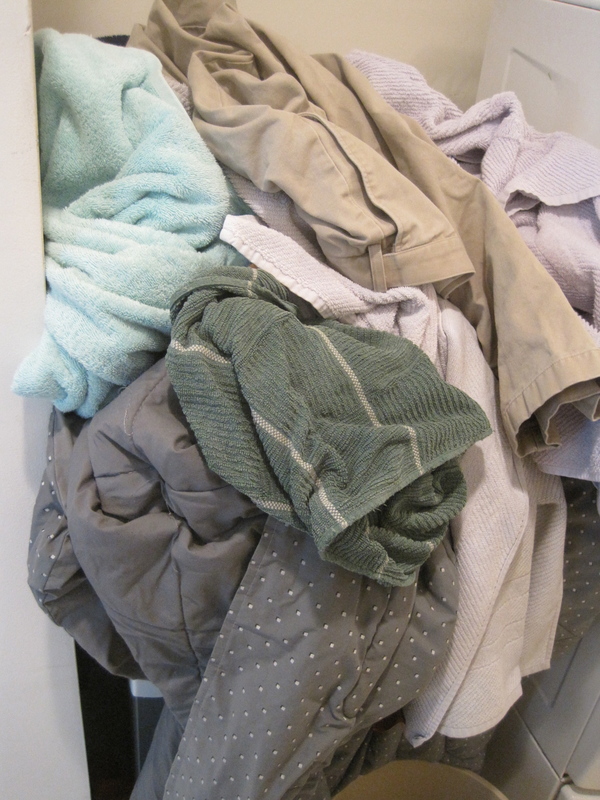 Clump # 19: Wash and dry stuck-laundry pile. I find the word “literally” overused these days, but I am going to use it a few times here to paint a picture of a Blue Monday. 1. I made the mistake of weighing myself this morning. My overeating at last night’s Superbowl party literally super-sized me. 2. I had my hair colored recently, and it was darker than I wanted/expected it to be. I literally have a dark cloud over my head (as well as figuratively). 3. I am literally airing my dirty laundry in public. I’ve been told that to keep a front-loading washing machine balanced you should wash similar-weight items together, so I had been holding aside some towels and other heavy things for a big towel wash. Towel mountain rose with other heavy, not-needed-every-day items. It was about to erupt. 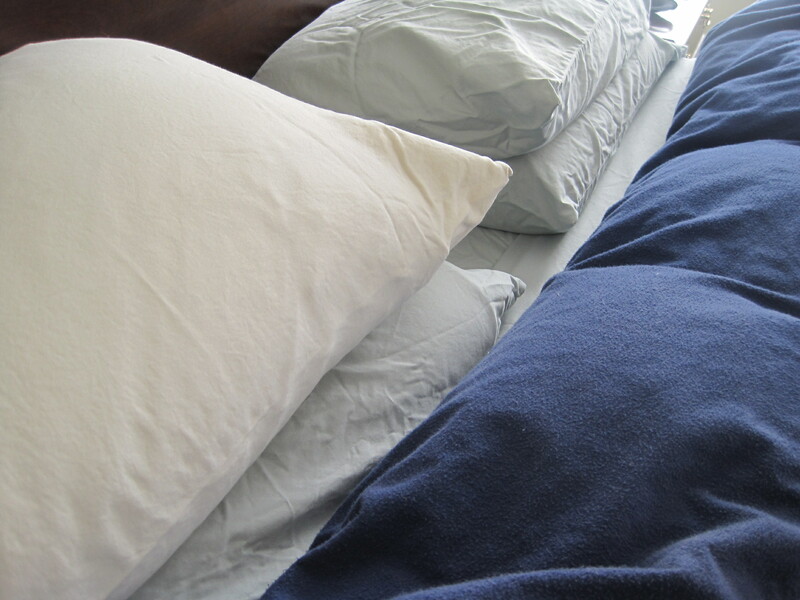 I searched the term Blue Monday and came across a good description of its origin at the Canada Science and Technology Museum’s site: “Laundry has generally been considered by women to be the most dreaded of household chores. Indeed, ‘Blue Monday’ (the popular term for laundry day before the turn of the century) hinted to more than the blueing agent used in rinse water, it also signalled the drudgery involved in the washing process. ‘Blue Monday’ in itself, however, was somewhat of a misnomer. In fact, prior to the automation of laundry, the typical wash cycle involved days of hard labor.” What am I whining about? I searched google images for a picture of the hardy, hard-working laundry-washers of yore. I loved this work by Carolyn Brady, .artsinmilwaukee.org. 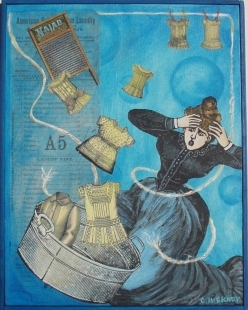 What was the most constraining, her laundry line or her corset? I’m always surprised by the varied pictures that pop up when doing an image search. I took a little cyber-trip to London while many loads of laundry cycled through our miraculous machines. 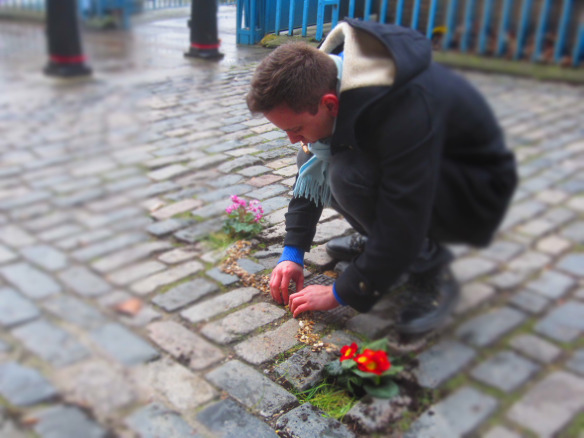 This picture was from a post called Blue Monday on the Pothole Gardener site, http://thepotholegardener.com/ So cool! At the bottom of the page was a short, happy-making video of some of their installations and the reactions they elicit. I clicked on a link there to another blog called The 1001 Club, London’s Alternative Bucket List … fun, funny, and inspiring. Planting in pot holes and seizing the day. Brilliant! The laundry pile photo, up above, is deceiving. Layers of stuckness were compressed beneath the surface. 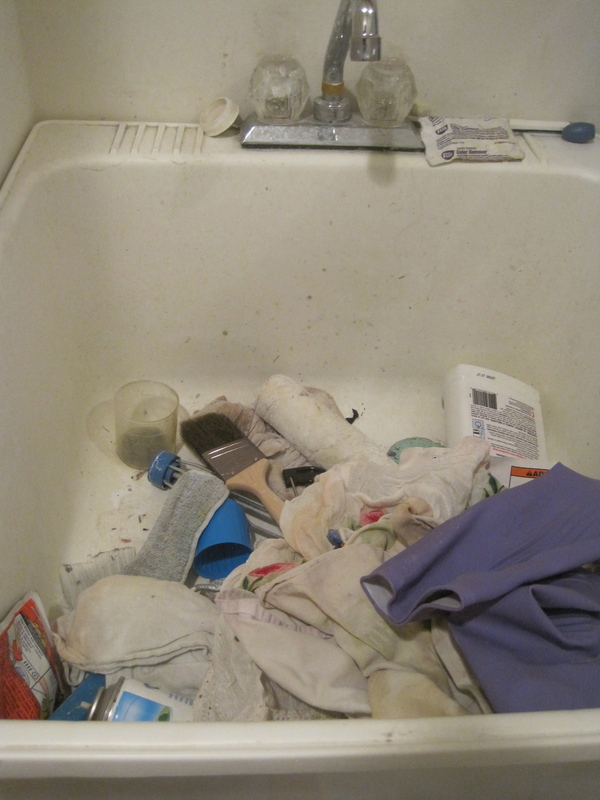 Eventually I reached the bottom layer: old cruddy painting supplies and other yucky stuff in the excavated utility sink. What ho! And After: Spit spot! 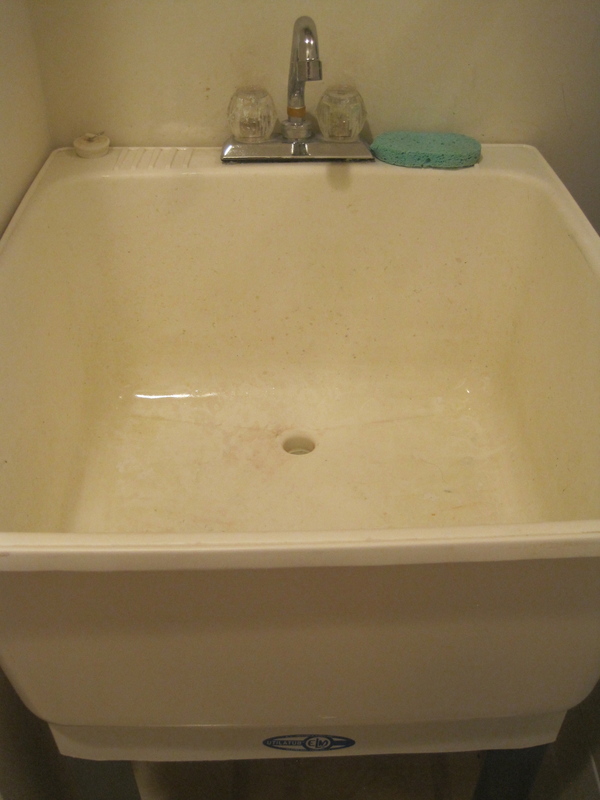 Well, not spotless, but close enough for a paint brush washing sink. It’s funny how things come together. I swear I didn’t set this up. 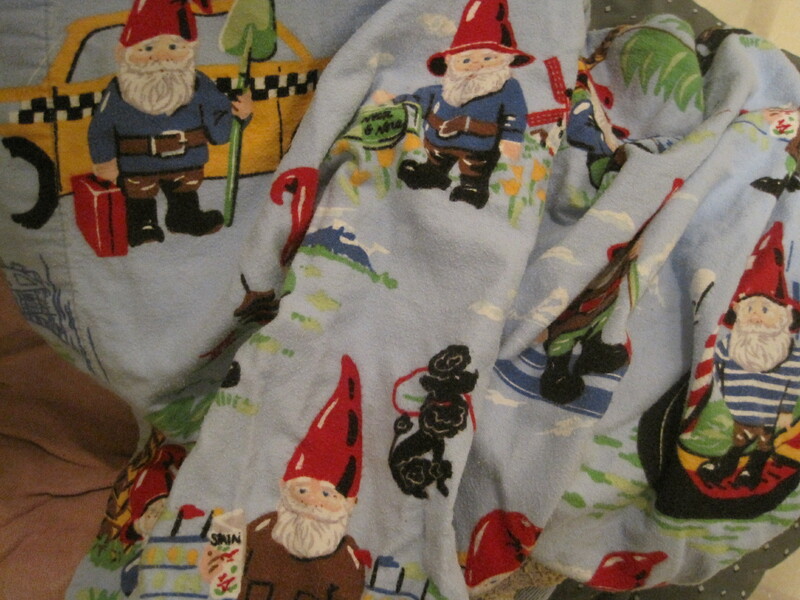 These sheets were in the middle region of laundry mountain. I laughed when I looked closely at the traveling gnome. He did not have a London picture, but his spirit of adventure and living life with gusto reminded me of the London blogs I had visited. Cheerio!